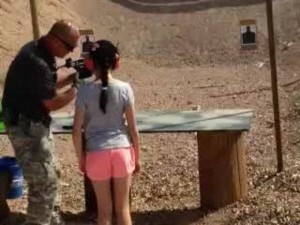 9-Year-Old Shoots Instructor With Uzi, Range Changes Policies. A shooting range in White Hills, Arizona, on the boarder of Arizona and Nevada, had a tragic accident happen earlier this week. On Monday morning an instructor, 34-year-old Charles Vacca, was accidentally shot and killed by the 9-year-old that he was teaching. He was instructing her on how to use a Uzi, which is a fully-automatic weapon. This accident has people asking why a 9-year-old was shooting a gun like that in the first place. In many states, it is completely legal for a child of that age to operate a gun, fully-automatic or not, under the supervision of a professional at a shooting range. However, this accident has many people rethinking that idea. The gun range itself, Arizona Last Stop’s Bullets and Burgers outdoor shooting range, has since raised it’s age limit from 8-years-old to 12-years-old to be able to shoot a weapon and they also made another new regulation that shooters have to be at least 5 feet tall as well. Vacca’s family says that they feel bad for the little girl and know that this was all just a tragic accident. They don’t want this to consume her or her family’s lives. Many people think that no matter the age, a child shouldn’t be allowed to shoot a firearm. 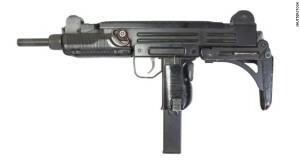 Gerry Hills, who is the founder of Americans for Gun Safety said that it was reckless to let a 9-year-old shot an Uzi. “We have better safety standards for who gets to ride a roller coaster at an amusement park,” Hills said to the Associated Press. He also added that he didn’t see “any reason in the world” why that girl’s parents would let her shoot an Uzi. In the video below you can see the tragic event right up until the horrible moment. 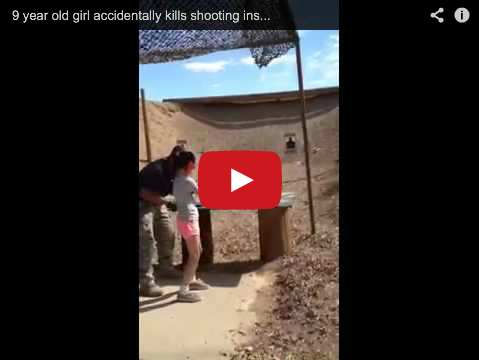 Everything seemed fine and the girl fired off the first shot just fine. It seems though that the gun slipped out of her left hand and she tried grabbing it with her right, possibly pulling the trigger and sending the recoil upward. Until a child gains the required mental and physical ability to handle a gun and understand directions to the fullest, they should not be able to fire a weapon of that magnitude in my opinion.